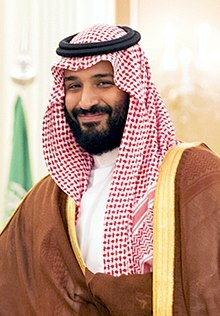 ↑ "Profile: Saudi crown prince Mohammed bin Salman". www.aljazeera.com. Archived from the original on 22 June 2017. ↑ "Mohammad bin Salman named new Saudi Crown Prince". TASS (in อังกฤษ). Beirut. 21 June 2017. Archived from the original on 22 June 2017. สืบค้นเมื่อ 22 June 2017. ↑ "Mohammed bin Nayef kingpin in new Saudi Arabia: country experts". Middle East Eye. 1 February 2015. Archived from the original on 3 February 2015. สืบค้นเมื่อ 1 February 2015. ↑ Transcript: Interview with Muhammad bin Salman Archived 9 January 2016 at the Wayback Machine. The Economist, 6 January 2016. ↑ Anthony Bond, Rachael Burford (24 October 2017). "Saudi Arabia will return to moderate, open Islam and 'will destroy extremist ideas', says crown prince". Daily Mirror. สืบค้นเมื่อ 24 October 2017. ↑ CNN, Nicole Chavez, Tamara Qiblawi and James Griffiths. "Saudi Arabia's king replaces nephew with son as heir to throne". CNN. Archived from the original on 22 June 2017. ↑ Raghavan, Sudarsan; Fahim, Kareem (21 June 2017). "Saudi king names son as new crown prince, upending the royal succession line". The Washington Post. สืบค้นเมื่อ 21 June 2017. ↑ "Saudi royal decrees announcing Prince Mohammed BinSalman as the new crown prince". The National. Abu Dhabi: Abu Dhabi Media. Archived from the original on 21 June 2017. สืบค้นเมื่อ 21 June 2017. หน้านี้แก้ไขล่าสุดเมื่อวันที่ 7 กุมภาพันธ์ 2561 เวลา 16:59 น.